This white decorator receptacle from Claro was designed specifically to work with the décor of your home to create an attractive, unified look. 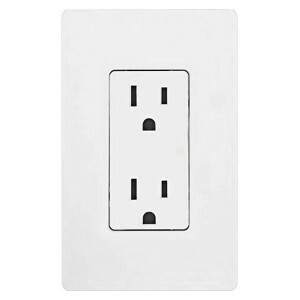 The Lutron CAR-15-WH Electrical Outlet, 15A Claro Decorator Receptacle - White comes finished with a smooth surface that makes for a simple but decorative look. It’s also easy to clean! This sleek, low-profile design also allows the Lutron CAR-15-WH flow smoothly with your walls. Throw away those unattractive receptacles and start enjoying the beauty of the Lutron CAR-15-WH in white today! Not only will you love the sleek look of the Lutron CAR-15-WH, but you’ll also love how simple it is to set up! With easy-to-use instructions and dual wiring options that give connection options at the rear push-ins or side terminals, the Lutron CAR-15-WH can be installed in a matter of minutes so that you can start enjoying it right away. The durable material that this product is made with is sure to make it last for years to come. Let the style of your home flow and equip your walls with the Lutron CAR-15-WH Claro decorator receptacle in white today!